Professionals rely on specialty tools all the time because just anything off the shelf of a department store usually won’t suffice. For chefs, cookware and knives might be the first thing that people think of. However, the right shoes are equally as important as the right knife. Think about it; chefs spend most of their working day on their feet. In a larger kitchen, they are probably more reliant on their footwear than they are on the cutlery because they spend most of their time back and forth between stations and front of the restaurant so you could even say that a chef’s footwear is the most necessary tool in their arsenal. No matter the size of the kitchen, any chef is going to find themselves on their feet for hours on end. The best chef shoes provide proper arch support to keep your feet from getting tired, a cushioned heel to protect against impact, and breathable uppers to prevent your feet from getting too hot. A decent pair of kitchen shoes with a comfortable fit do more than making it easier on your feet, however. Good arch support and a cushioned heel also help protect your back, knees, and hips. All of which take a beating when you are on your feet all day. Even in the cleanest kitchen, you are going to find oil, grease, water, and soap on the floors. The old trick of throwing some salt on the slick spots for grip will only take you so far. The best chef shoes have a slip resistant sole that provides the right amount of grip to prevent slips and falls. Of course, no shoe is going to save you if you walk directly through the bottle of olive oil that dripped onto the floor, but a good sole will help in most occasions. Like any soles, these will wear out after a while. If your soles start losing their tread, it’s time to trade in your shoes for a new pair. Not everyone’s foot is the same as everyone else’s. Some folks have high arches, and others have flatter feet. If your shoes allow you to change out your insoles, this is a great buy. You can then buy separate orthotic inserts for flat feet or high arches and replace the standard insoles. Ultimately though, in the first instance, buy ones that fit your foot, so you get the added support and comfort. You can also look for insoles that match your gait. If you are serious about comfort, then you may want to explore this option as well when choosing new insoles. Most specialty stores will analyze your gait for you and recommend the right insole to match. While you may not be working in a machine shop, you still run the risk of heavy cookware and knives falling in a kitchen. 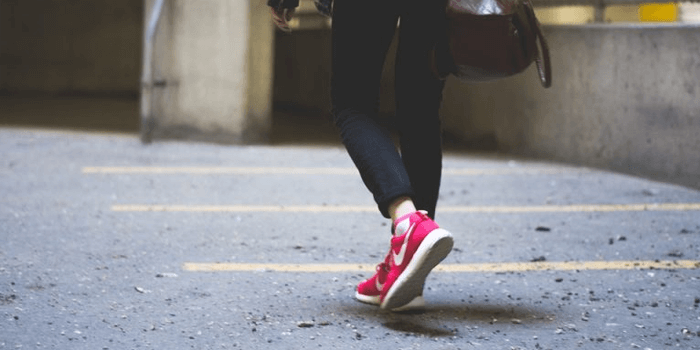 The last thing you want is for something that can do considerable damage landing on your foot because if you can’t walk or stand, you can’t do your job effectively. The best chef shoes will offer varying degrees of protection (such as steel toe or composite toe) depending on the comfort level, budget, and your preference for safety. 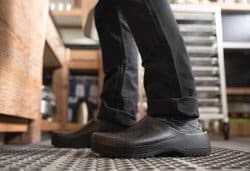 Although you can buy comfortable steel toe work boots at reasonable prices, these are often overkill to be worn as kitchen shoes and will be an unlikely match to the rest of the chef attire. As a chef, you are spending a great deal of your time in the kitchen, but you are likely going to have to make trips into the restaurant front or dining area as well. Presentation matters when you are visiting with your customers so you are going to want to have a shoe that you can easily keep clean. Spilling food and sauces may be an everyday part of working in the kitchen, but you don’t have to let your customers know about it. Not only does it look bad, but it gives an appearance of a dirty kitchen. Chef clogs without laces are an extremely popular pair of kitchen shoes, and not just because they are easy to put on and take off. Laces can come untied throughout the course of a shift and untied laces pose a couple of problems. First, they can cause you to trip, and you don’t want to take a spill especially if you are carrying something. Secondly, untied laces drag across the floor and pick up all types of nasty things. Having to continually tie them transfers all that grossness to your hands and that is not the most hygienic thing for a chef. Lastly, spillages on your laces are much harder to wipe clean, and need washing as opposed to a simple wipe down. Like any other work shoes, the best kitchen shoes are mostly a matter of preference determined by features and build quality. So, if you are looking for something new for the kitchen, we have reviewed ten that many others consider among the best in hopes that we can help make your decision easier. 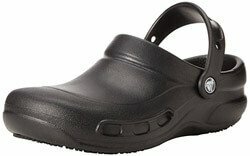 Made from molded Croslite material, the Bistro Clog is a lightweight pair of chef shoes that also provides the wearer with the Crocs Lock slip resistant thread on its sole for better grip. 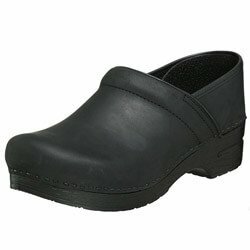 A favorite among restaurant workers, this one also offers a contoured foot bed for added comfort. Thicker padding extends from the toe along the top of the foot to give extra protection against falling objects and spills. Like with most clogs, these too have a wide toe box area, which makes them a good choice of shoes for people with bunions. Bistro Clogs are designed for roomy comfort and ease of wear. Simply slide your foot into the shoe and pull the heel strap up for a more secure fit. This odor-resistant shoe is also easy to clean and quick drying to keep them looking good and hygienic. For a more professional look, some chefs opt for the Skechers Rockland due to its Oxford style design. The leather upper provides a classier look while the rubber slip resistant sole gives the wearer plenty of traction to prevent slips and falls. Available with either a composite safety toe or a steel toe, this shoe offers plenty of protection against damage should anything fall onto the tips of your feet. A comfortable shoe made for people on their feet all day; the Rockland offers excellent support and an extended driving style heel for even more protection against slipping. If you need more, or less, arch support, this shoe comes with a removable insole. If you find that the one which comes with the shoe isn’t right for you, simply replace it with a more fitting one available at any Skechers store. The body of these stylish shoes for chefs are waterproof too so they help resist spills that land on your footwear from making their way through to your socks. The inclusion of memory foam material also makes for a nice feature that allows the shoe to conform to your foot as you wear them. It is important to note that these are lace up shoes. While tying them tight will help keep them from coming loose, you may have to content with having to tie them up occasionally. For those that want the Skechers name and comfort without the laces, they also offer the Mcallen slip on model. 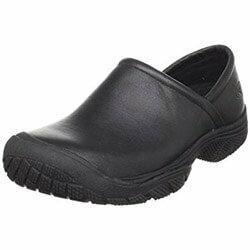 This slip on shoe is made from synthetic materials making clean up easy and the mesh fabric upper provides a great deal of breathability. Offering a slip resistant outsole, these deplorable kitchen shoes will help give the wearer plenty of traction in slippery situations and extra padding around the collar helps prevent rubbing and blisters. 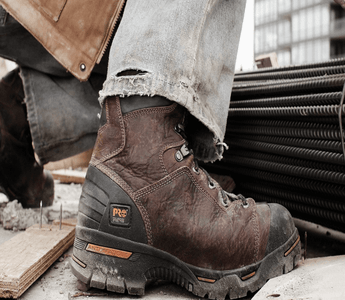 Like the other Skechers work shoes, the Mcallen comes with either a composite safety toe or a steel safety toe to protect your feet from falling objects that could take you out of the rotation. 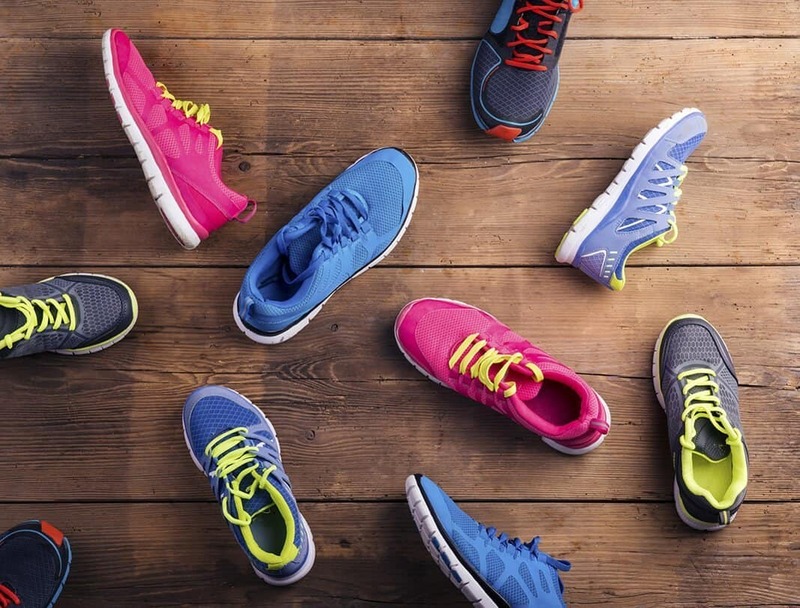 As with the Skechers Rockland, the Mcallen includes memory foam to help conform the fit to the wearers foot. 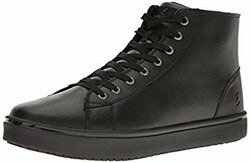 In our opinion, these make for some of the best chef shoes because in addition to comfort and safety, they provide good breathability that adds to the overall experience for someone wearing them for long periods of time. Birkenstock is known for high quality footwear and that is exactly what you find in these exemplary kitchen shoes. The polyurethane upper is easy to clean and the synthetic sole provides the level of slip resistance you would expect from footwear that boasts a certified anti-slip outsole. The one-and-a-half-inch heel makes them easy to put on and take off without having to worry about them coming off during the hustle of a workday and like other Birkenstocks, these are made to mold to your foot providing the best fit and superior comfort. Using the original Birkenstock foot bed, the Profi Birki clogs help distribute your body weight evenly over your whole foot, so you don’t feel pressure at certain points as you stand for extended periods of time. However, the most impressive feature is the fact that you can wash these shoes in a dishwasher. Simply remove the insole and run them through a cycle to get them clean and sanitized. Just don’t run them through with the plates your customers eat from. The MOZO Sharkz is not only one of the best shoes for male nurses, but also a favorite among chefs due to its durable synthetic upper and ASTM (American Society for Testing and Materials) rated rubber sole, which helps give maximum traction even in oil. This slip ons provide the wearer with a removable gel-cushioned insole that you can change out for one that gives a better fit or level of comfort and its side vents help provide a better than expected level of breathability. Keeping these shoes clean is the major selling point. Made from synthetic materials means they are easy to wipe down or scrub even the toughest stains. They do have a smaller opening for your foot making them a bit tougher to slip on and off than some of the other models, but there is enough flexibility at the cuff that it isn’t a major concern. Unfortunately, the lack of toe protection offered is a problem. Without toe or foot protection, you are more vulnerable should something fall onto your foot while at work. With a leather crafted upper, the KEEN Utility PTC is perfect for working in the kitchen and classy enough to make frequent trips out to the dining room. Its rubber sole exceeds ASTM non-slip testing standards so you know you will keep your footing as best you can when walking through the oil and water spills on slick kitchen floors. Water resistant, the Utility PTC will help keep your feet dry should something spill on them and they are easy to wipe clean to restore their appearance quickly. One major benefit to these almost perfect chef shoes is stability provided by the leather upper to give additional support where needed. The insole is made with memory foam to help keep the inside support up to standards as well. Also, the medial side gore makes sliding them on and off easy while providing an extra level of comfort to the wearer. Like some of the other kitchen shoes on this list, this one does not offer added protection. While leather itself will help to an extent, without added toe protection you are vulnerable to the occasionally dropped pots and pans. Emeril has built his name as a celebrity chef and endorses many different kitchen tools. It only makes sense that he would also endorse some of the best kitchen shoes that money can buy. These leather lace up shoes offer an oil and slip resistant outsole that provides excellent traction on slippery floors. Clean up is also easy due to the water and stain resistant system that not only keeps the shoes clean but also helps repel water to keep the wearer’s feet dry. Unlike some of the other leather chef shoes, Emeril’s comes with an odor-resistant lining that also provides a good amount of breathability to help keep feet cool throughout the day. Some may appreciate this shoe’s high-top design that gives a great amount of support to the wearer’s ankles. For foot comfort, these shoes are designed with B.A.M. (balance active movement) memory foam and a comfort molded midsole. While the high-top design is ideal for added ankle support, it makes taking the shoes on and off much more difficult. Of course, with this design comes laces so you do have to consider the possibility of those coming untied during your shift. While we have had one unisex shoe covered on this list, the rest have been geared towards male kitchen staff. This one from Skechers is made for women. Made with the same quality anti-slip protection as the other Skechers shoes reviewed on this list, the Sure Track also provides the both the composite and steel safety toe options as well. The leather upper provides a stylish look that makes clean-up easy while also providing an elevated level of durability. Comfort is no question thanks to the cushioning that makes the Skechers name famous. The wider opening also makes for ease when you have to put them on and take off, however, the wide cuff does open the door to food and liquid spills making their way into the shoe. Also, unlike some of the other slip on models, there is no strap to use to pull them on and off. Instead, there is a separation between at the heel to slide your finger into for a better grip. Comfort is the first thing that comes to mind when you talk about this shoe from Dansko. Providing exceptional arch support, a padded instep collar, and a rocker bottom makes this an easy one to wear for extended periods of time. The added breathable PU foam helps keep the wearer’s feet cool when the kitchen heats up. While on the higher side when it comes to price, that is expected considering the oiled leather upper and contoured leather insole. Using oiled leather, the Dansko is protected from stains and water that may splash onto them throughout the course of a shift. With a shock-absorbent rubber outsole you also gain extra comfort with a decent level of protection from slippage. These are made with craftsmanship and the style, and look much better than any of the others reviewed here and the oiled leather is the reason. Unfortunately, they do not offer toe or foot protection should something fall and land on your feet. The leather will provide a minimal amount, but not as much as those with added safety built in. Additionally, these are not billed as anti-slip shoes. The rubber sole will give a good amount of grip but they are not going to give the same amount of safety as some of the other reviews here. Last on our list is the Merrell Encore Gust. Another high-quality name in shoes, Merrell’s offering does not disappoint. Its leather upper provides an exceptional style that you can wear both in the kitchen and the dining area alike. For comfort, Merrell’s Encore Gust includes an AirCushion heel and an Ortholite foot bed that makes wearing it for prolonged periods of time effortless. Lined with the Aegis antimicrobial solution, it prevents odors and the Eva style foot bed allows to air out easily. Slipping is minimized due to the M Select GRIP sole that helps keep your footing in testing situations. The Encore Gust offers good looks and are easy to wear. Not only are they comfortable, as most Merrell shoes are, but they are easy to slide on and off. The best chef shoes aren’t hard to find if you look around. No matter what style, material, or brand you favor you are likely to find something that offers the support and protection you need to deal with a hectic shift in any kitchen. Out of the ones reviewed here, the Merrell Encore Gust Slip-On is the clear winner in our opinion. While it does lack added protection, its leather upper will help cushion anything that falls on your foot. This, however, is made up for by both its looks and comfort.